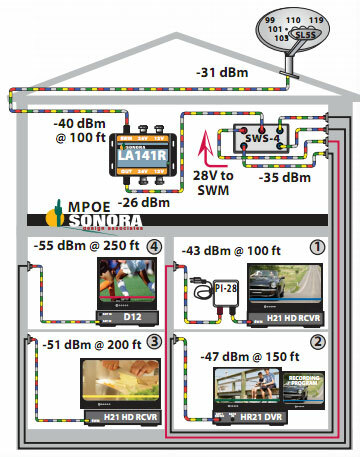 If the output of a single wire multi-switch is split to multiple rooms or apartments, the receiver signal levels are low after 200 feet of RG-6 cable. 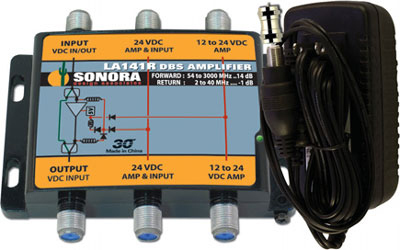 Model LA141R-T boosts basic cable and DBS signal level off-setting the loss of an 8-way splitter while passing data modem and receiver control signals from the receiver to the switch. Model LA141R-T includes model PS12250 12 volt power supply. Model LA141R-T24 includes model PS242000A 24 volt power supply. The -nbsp;output -nbsp;of -nbsp;a -nbsp;Single -nbsp;Wire -nbsp;Multi-switch -nbsp;is -nbsp;split -nbsp;to-nbsp;multiple rooms or apartments and the receiver signal-nbsp;levels are low at distant locations. Model -nbsp;LA141R boosts cable and DBS signal levels-nbsp;of -nbsp;setting -nbsp;the -nbsp;loss -nbsp;of -nbsp;150 -nbsp;feet -nbsp;of -nbsp;RG - 6 -nbsp;while -nbsp;passing-nbsp;data modem and receiver control signals from the-nbsp;receiver to the switch. This product is a universal coaxial amplifier. The-nbsp;amps works with ATSC, CATV, DBS -amp; MFH2. -nbsp;Includes-nbsp;passive 2 to 40 MHz sub-band return. SL5S switches include automatic gain control for a-nbsp;constant -31 dBm output. The maximum recommended-nbsp;dish to receiver distance for a SL5S and SWS-4 is 200-nbsp;feet of RG-6 without a LA141R line extender. dish has an acceptable -nbsp;signal level of -55 dBm.